More than 25 U.S. senators, led by Oklahoma Republican Jim Inhofe, are calling for an independent investigation of the U.N. Intergovernmental Panel on Climate Change in the wake of the Climategate scandal. Inhofe, ranking member on the Environment and Public Works Committee, outlined several reasons for an independent investigation in a letter to U.N. Secretary-General Ban Ki-Moon. Senate Minority Leader Mitch McConnell (R-KY) is among those who signed the letter. Speaking at The Heritage Foundation this week, Inhofe said he had no confidence in the United Nations’ conducting an investigation of its own panel. “The U.N. isn’t accountable to anyone,” he argued, highlighting the problem of rooting out possible corruption in the IPCC. “The investigation must be conducted without political interference and manipulation from individual countries, non-governmental organizations, those within the U.N., those who have contributed to the IPCC, those being investigated, or any closely related associates,” Inhofe wrote in the letter (PDF). 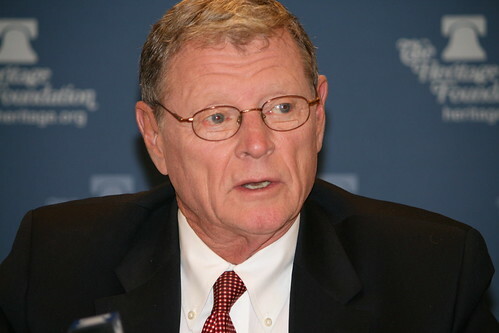 During his Heritage Foundation visit to The Bloggers Briefing on Tuesday, Inhofe noted how 10 years ago he began calling for his colleagues to slow down in taking action on climate change. Worried about the high costs estimated for action on climate change, Inhofe began his own investigation into the validity of the science behind the theory. Since then Inhofe has been leading the fight against climate change hysteria. The latest chapter in this fight has unfolded with the Climategate scandal. In light of evidence that not only has data been ignored and manipulated, but that dissenting voices were silenced, Inhofe vowed to aggressively pursue an independent investigation. There is precedent for an investigation. Irregularities in the U.N.’s Oil for Food Program led to an independent inquiry from Paul Volcker. With the Copenhagen Climate Change Conference in full swing, his timing couldn’t be better.